St. Luke's responds to God's call to love and serve, inviting all to celebrate life in Christ. The Episcopal church believes that there is room for everyone to worship together while serving God in the world. We may disagree on how best to meet current worldly needs but still worship together with respect for all views. Our governance and doctrine is protestant while our liturgy is from the roman church. We are founded on Thomas Cranmer's [1489 - 1556] order of authority being 1) the Bible 2) Tradition and 3) Reason. 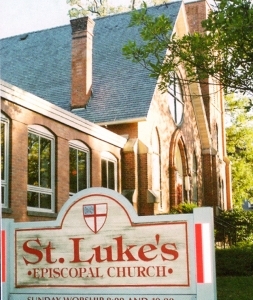 St. Luke's was founded in 1855 near the banks of the Mississippi River on Hwy 61 in Historic Hastings, MN. We are 20 miles south of St. Paul, just south of Cottage Grove, and west of Prescott, Wisconsin. * Spiritual enrichment to nurture your personal walk with Christ. * A welcoming Holy space for solitude, prayer & meditation. * Opportunities to meet people with shared values. or life story, is welcome here.